and also BURRO.. pls make a comment here that will help me to start in 3ds max..
can you label the steps of creating a t34 model. 1st step is open 3ds max then next then next. [2CP] Naval Infantry - the backbone of Naval Infantry forces. Naval officers can call naval artillery strikes (not as powerful as the other one) at the cost of 75 munitions. have the ability to throw flares. enemy units caught with it is prone to accurate indirect fire. [2CP] Naval Spetsnaz - call in an elite 4 man team. capable of deep infiltration and mass sabotage behind enemy lines. they can be summoned to any ambient building. they can camouflage but movement speed is reduced. armed with PPS-43 sub machine guns for close combat, F1 Frag grenades, concealing smoke when reached vet 1, and demo charges to lay demo everywhere. note: they wear an observer's camo uniform, Naval cap, and a cross ammobelt just like the naval infantrymen. [2CP] Naval Supply - increases your manpower, munitions, and fuel rate by 40% in a period of time. after this ability, it greatly decreases your manpower rate in 2 minutes. [3CP] Naval Gunfire Support - call a devastating artillery bombardment from the big guns of the Baltic Fleet! note: similar to the God of War. 6 man armed with 5x default mosin nagant rifles and 1x ppd-34 submachine gun for the commissar. They can also throw F1 Frag Grenades and fire VPGS rifle grenades. But once "One Last Effort" is unlocked. Newly deployed shtrafniks have improved armaments. + 6-man squad armed with 2x SVT-40 rifles and 2x ppsh-41 submachine guns and 1 pps-43 for the commissar. + New projectiles such as RGD-33 Bundled Grenades and RPG-43 antitank grenades. Despite of these new weapons. They still proved to be unreliable on their own and has to be commanded carefully. As these men are troublemakers, deserters, freethinkers, looters, malingerers,and politically un loyal. [2CP] Soviet Propaganda - Propaganda loudspeakers in outposts and in your headquarters will inspire your men to fight harder inside your territory. receiving defensive bonuses. [2CP] Penal Battalion - Soviet High command now grants you an entire battalion of shtrafniks. Infantry build times, reinforcement times, and cost is greatly reduced. [1CP] One Last Effort! 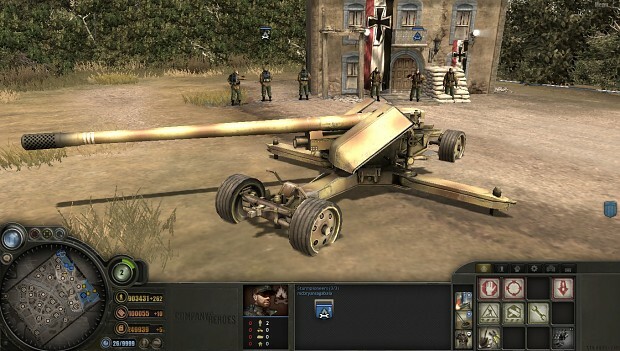 - grants your shtrafniki squads with new weapons and abilities, and all infantry will now capture points faster and will be less prone to suppression. Note: this is not like the air raid. It's not raining bomblets. Rather just like a strafing run and dropping one bombs each plane. [3CP] Russian Colossus - call a KV-1 Heavy Tank into the battlefield. i have another idea for Zis-2 and Zis-3 Anti-tank guns. note: gunnery officer is armed with a pistol. hi I wanna suggest the T34/85 ''Ace'' Medium Tank as a reward unit for any heavy tank unit that you wanna add in the future. this tank is just like the Normal T34/85 but the difference is the Red Star in it's turret and the commander in the cupola. He wears a dark colored uniform same as the naval infantry wears but there is no ammo belt wrapped around the uniform, and the cap that the current strelky flag bearer wears. the driver's hatch is open just like the SU-76 in the EF version 2.30 and the driver can be seen inside. This Ace T34 is more faster, more maneuverable and more accurate. It also has couple of abilities: it can ambush and it has smoke screen. it has no upgrades like the pt mine roller or cage armor or the flamethrower... it's gunnery skills and abilities are his specialty. Hi to all. I would just like your votes about the possibility of adding a Dhsk Heavy machine gun team as an armory upgrade for sg43 goryunov. Beat back the relentless onslaught of the germans! Brave partisan fighters are willing to fight for the Motherland. Wreak havoc behind enemy lines through sabotage and harrasment to weaken their frontline. stir chaos and confusion among the germans by using infiltration and guerilla tactics. [1CP] - Partisans - brave local fighters ready to fight for the Motherland! Armed with variety of weapons. They operate behind enemy lines causing chaos and confusion in the german rear. They can be summoned into any ambient building even in the fog of war. They can camouflage but movement speed is reduced. Note: The first vet 3 partisan squad will become a Partisan Command squad. not like the major but this acts like a lieutenant who boost the morale of nearby partisans. abilities will be removed and replaced by ''maintain command range'' this squad will also have new default weapons. maybe 1x dp-28, 3x svt, and a tokarev pistol for the partisan commander. [2CP] - Partisan Raid - all partisan fighters receives big offensive bonus. their movement speed is also increased and less prone to suppression. [2CP] - Local Support - Locals are now willing to support the partisans against the Fascist occupiers. Increasing your manpower rate. Friendly sectors will have extended sight range. [2CP] - Soviet Aid - a soviet cargo plane will drop some supply crates to a specified area. cost is 100munitions. 3x crates contains +75 munitions, +75 fuel, 1x 82mm mortar, 1x SG-43 machine gun, 1x ZiS-3 AT gun. [2CP] - Sabotage Groups - Sabotage groups will now join in the ranks of the partisans! Partisans can now booby trap buildings, sabotage enemy points, and drop mines everywhere. They can also build tank traps and barb wires. this structure allows you to promote your regular army into an elite fighting force. i know this is crazy but umm.. can u make the Zis 3 gun to be able to fire in artillery mode like the SU-76? for the urban combat doctrine..
i seen that in real combat when Zis-3 serves as an artillery placement during urban combats..